A brilliant result in the sunshine at Filton! At last we saw a glimpse of spring! The team pulled out all the stops from the start and were very happy to complete the morning foursomes with 4 wins. 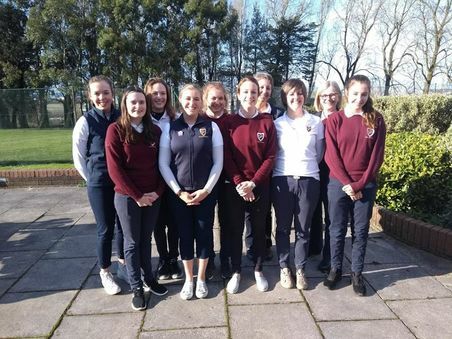 We changed the pairings for the afternoon; the pairs all seemed to gel well and spectators and supporters were treated to a display of more excellent foursomes play. The result was an emphatic 8-0 win for GLCGA, but all credit to the GGU boys who battled well and once again gave us some excellent matchplay experience in preparation for SW inter-county match week. We are extremely grateful to GGU for this annual fixture and hope it remains on the fixture list for many years to come. Today's team: Caley McGinty, Alex Saunders, Alex Giles, Sam Round, Claudia Ovens, Grace Connelly, Rachael Archibald and Jess Brown.